Trearddur or Trearddur Bay (Welsh: Bae Trearddur) is a village, seaside resort and community south of Holyhead on the west coast of Holy Island off the north-west coast of Anglesey in Wales. The historical name for the settlement is Towyn Capel or Tywyn y Capel ("sand dunes of the chapel"). The name Trearddur was adopted from a nearby hamlet known as Tre Arthur or Arthur's Town. It is not known why the village was renamed but by the late 1800s maps label the town as Tre-Arddur or Treaddur. At the centre of the beach lies an ancient burial ground known by the old names[clarification needed] and which was excavated in 2003. At the 2001 census, the community had a population of 1,858, reducing to 1,686 at the 2011 census. There are two general shops in the centre of the village, along with a garage, two golf courses, one 18-hole (Holyhead Golf Club), and one small 9-hole, and two hotels including a large hotel, Trearddur Bay Hotel, which overlooks the beach. There is also a number of self-catering holiday cottages, many with views of the sea and easy access to the beaches. On the two beaches — Porth Diana and the main beach — there are some shallow scuba diving sites, and the main beach is one of the tourist hotspots of Anglesey. There is excellent sea fishing in the area. Boat trips and fishing trips are available from the beach. Horse riding is available, as is kayaking and sailing. The seas around Holy Island provide some of the best kayaking in the world. Trearddur Bay Sailing Club (founded in 1919) has over 1000 members but, unusually, operates only in the month of August. Visitors can walk along the Anglesey Coastal Footpath towards neighbouring Rhoscolyn or in the other direction towards Porth Dafarch and on to South Stack and the RSPB Reserve and lighthouse. Near the beach is a play area and a football pitch where Trearddur Bay United F.C. play. The village has had a lifeboat station since 1967. Until 2012 an electoral ward existed of the same name. The ward included the community of Rhoscolyn with a total population of 2,228. 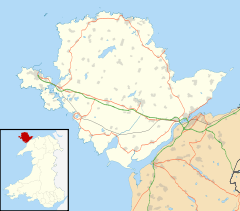 Following the Isle of Anglesey electoral boundary changes Trearddur became part of a larger Ynys Gybi ward, which includes part of Holyhead. At the local level, the electorate of Trearddur are represented by twelve community councillors on Trearddur Community Council. ^ "RNLI: Trearddur Bay". Retrieved 16 February 2016. 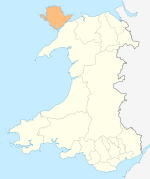 ^ "Isle of Anglesey (Electoral Arrangements) Order 2012" (PDF). legisaltion.gov.uk. The National Archives. Retrieved 2 December 2017. ^ "About Us". Trearddur Community Council. Retrieved 31 March 2019. Wikimedia Commons has media related to Trearddur. Wikivoyage has a travel guide for Trearddur Bay. This page was last edited on 31 March 2019, at 21:40 (UTC).